Bison near the Grand Canyon, alongside Highway 67. Bison are on the list on animal carcasses requested of Arizona Game and Fish. FLAGSTAFF — Arizona Native American tribes on the hunt for animal hides, antlers, teeth and other parts for cultural and religious use have a unique new resource: the state's wildlife agency. 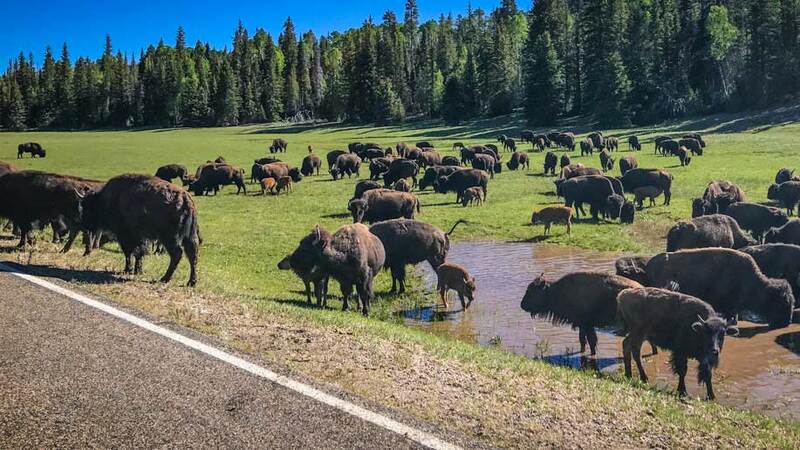 A recently launched program allows Arizona's nearly two dozen tribes to make requests to the state Game and Fish Department for animals that have died from poaching or natural causes, or after being hit by a vehicle. "It's all just opportunistic collection of what we find out in the field," said the department's tribal liaison, Jon Cooley, who grew up on the Fort Apache reservation in eastern Arizona. So far, the program's biggest customers are the Navajo Nation, which has collected bear and mule deer carcasses, and the Hopi Tribe, which has requested turtle shells, and turkey and water fowl feathers. The agency also gathered turtle shells for New Mexico pueblos, often used as ankle or hand rattles in ceremonial dances. 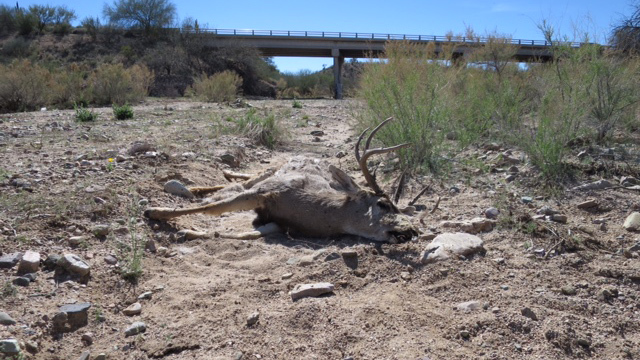 VIEW LARGER A mule deer the Arizona Game and Fish Department suspects was poached, 2017. The Game and Fish Department had been working informally with tribes for years to deliver animal parts, and Cooley said it's become more formal now with an established shopping list of sorts, and better communication with tribes and wildlife officials. The repository doesn't distribute feathers from eagles or other federally protected migratory birds. The federal government has a repository in Denver for tribes to legally obtain eagle feathers. The Comanche Nation in Oklahoma and a wildlife rescue organization near Phoenix distribute feathers from hawks, falcons and other birds to members of federally recognized tribes. In Arizona, the items highest in demand are tortoise shells. Also on the tribes' lists are mountain lions, bison, deer, antelope, and game birds like turkeys. The requests are specific, so Cooley said the department doesn't want the public donating animals or gathering them from the roadside. "What we don't want to become is a depot for dead critters. That's not the intent," Cooley said. One thing Game and Fish employees won't store is bears that have been tranquilized, because chemicals could be in the fatty tissues and some tribes prefer not to take animals that have been drugged, Cooley said. While the Navajo and Hopi have been the biggest beneficiaries so far, the plan is to allow tribes in a broader area — including Southern California, Nevada, Utah, Colorado and parts of Texas and Oklahoma — to draw from the repository if Arizona tribes don't need what's there, Cooley said. The Arizona program appears to be unique in the West. States like New Mexico and Montana allow people to salvage animals that have been killed on the road, sometimes for free, but it's not specific to tribal members. Alaska accommodates requests for wildlife from Native people on a case-by-case basis. The Native American Fish and Wildlife Society floated the idea at one of its conferences of buying freezers for the Arizona Game and Fish Department to store animals and "everyone was on board, everyone was in support of it," said Darren Talayumptewa, who sits on the society's board of directors. The society purchased four freezers for Arizona. "In the past, if the tribes had seen something dead, if it was roadkill, they would try to see how they could obtain it," he said. "Back in the day ... there was really no process for Native Americans obtaining various parts." "No part of the animal is squandered or discarded," said Clayton Honyumptewa, director of the tribe's Department of Natural Resources. "The ultimate veneration of any animal is through its use in ceremonies and prayers conducted for the renewal and continuation of life."